L.A. Red Carpet: The majority of the time were people just gushing over each loathers dresses and jewelery (Which is ironic because the movie shows us the corrupt of the rich). The majority of the questions asked were what was it like working with the new director, Jennifer Lawrence or Jennifer's haircut. I learned Josh Hutcherson can tap dance. That's good to know. But everyone was really excited to work with the new director and how he injected the franchise with his vision, tone and style. The producer came on the screen and basically said Jennifer Lawrence has always been the perfect for Katniss and has blown them all the way since her audition. And of course everyone is excited (as well as am I) Overall it was a good red carpet…nothing special. Jennifer Lawrence is nice and did manage to sign a lot of autographs for fans. I was impressed. The second film of the Hunger Games based on Suzanne Collins' trilogy is heading for another blockbuster opening. Director Francis Lawrence is at the helm with a screenplay by Somon Beaufoy and Michael Arndt. Not quite as violent and depressing as the first film introducing the dystopian society where every year a young person is selected from each district to fight to the death to maintain peace in the Panem. This episode neatly sets up for the next movie, but like all middle parts, it leaves you hanging. Katniss and Peeta (Jennifer Lawrence and Josh Hutcherson) have been living more comfortable lives after winning the last games. They have to prepare to go on a Victory Tour to tout the games to the other districts. In order to quell the rumblings of rebellion in the other districts, President Snow (Donald Sutherland) threatens the safety of her family and her boyfriend Gale (Liam Hemsworth) unless she toes the party line. 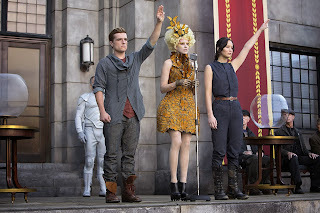 What they see on their train tour are signs of the Mockingjay and the raised 3 finger salute that has become a symbol of hope although those are quickly squashed by immediate execution. 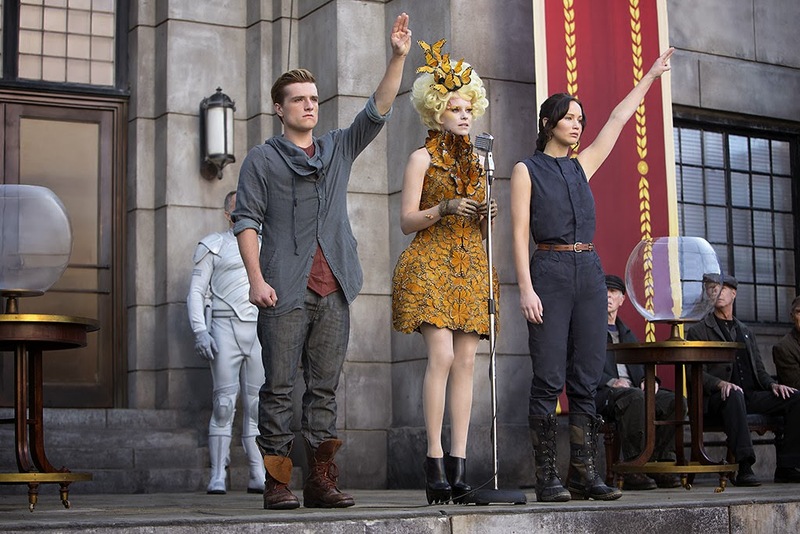 Snow's plan is to distract the populace by having Peeta and Katniss get married. The new gamemaster Plutarch Heavensbee (Philip Seymour Hoffman) advises Snow that they have to make the people believe that Katniss is one of them now, while treating the districts with a heavy hand. Snow announces that the 75th Games will be a Quarter Quell, an event that happens every 25 years. Each of the districts will send a pair of previous champions to battle it out with each other. Obviously this does not sit well with some of the tributes seeing that they were promised never to fight again if they won. There are some interesting couples this time around, and their trainer Haymitch (Woody Harrellson) advises to find alias again. As usual the competition is deadly and chaotic, but most of the eliminations seem to come from the man-made catastrophe's from their arena. Katniss is set on making Peeta come out last man standing. But it seems like some people are working to have Katniss win. The new players in the game are Jena Malone as Johanna who has an ax and a bad attitude. Lynn Cohen as Mags an elderly woman and her district partner handsome Sam Clafin as Finnick. Amanda Plummer as Wiress and her partner Jeffrey Wright as Beetee as the nerds of the tributes. The others you barely notice they are there except to be killed. The visuals are like the first outstanding. The costumes of as embodied by the denizens of the Capitol as worn by Elizabeth Banks as Effie Trinket who seems to exhibit a more human side than her usual propaganda as to the unfairness of making her tributes compete again. Even if it's just that she will lose the status afforded to her. Stanely Tucci as the annoying Caesar Flickerman the MC of the Games and his purple eyebrows and we just briefly see Toby Jones as Claudius Templesmith. Lenny Kravitz is back as Cinna, Katniss' stylist who is the only one that seems normal in the Capitol. Katniss who has been suffering from PTSD after the first games, has to come to terms with the suffering the people are experiencing from the hope that she instilled in them unwittingly. The message of this young adult series is like a 2x4 across the back of the head that absolute power corrupts absolutely. The film is well executed and satisfying, better than the first and definitely worth the popcorn. One a side not there has been some talks about making a Hunger Games theme parks which is disturbing when you think about it.